An office security camera provides many benefits to business owners and management teams. There are, however, many different types of security cameras. So how do you know which product is the best office security camera for your applications? Below we’ll examine some useful ways to determine the proper security camera type, depending on specific needs. For direct help, contact a member of our sales team and discuss your options in detail. Selecting security cameras for your business will first depend on what you’re looking to achieve. For instance, monitoring employees in a small office won’t require the same type of camera as a large office or warehouse setting. Similarly, indoor and outdoor surveillance needs are different, as are daytime, nighttime, and coverage sizes. Let’s continue by addressing some of these different settings separately. Small office surveillance cameras can range in style, size, type, and, of course, cost. Typically, video monitoring in small offices is done to monitor employees and visitors. What this means is they don’t typically need to be highly innovative CCTV products. Rather, they can be fairly inexpensive, even if you need a multi-camera system for full coverage. Bullet Cameras are an inexpensive option if you only need to have a small office security camera covering a single point. They are ideal for mounting to a wall and their installation can generally be done without professional help. Large office surveillance cameras will obviously need to cover a larger area than their small office counterparts. You’ll need to measure the coverage distance to select the right camera and lens. Many large office managers choose to implement more involved video surveillance systems for both employee monitoring and asset security. They also typically include more than one office security camera, which means you’ll be looking at full video surveillance systems. Dome Cameras are the most common choice for large office settings. One reason for this is that they can operate without anyone knowing exactly where they are looking. Additionally, a dome camera is better for mounting to a ceiling and generally provides a wider field of range than their single-focus counterparts. Warehouse surveillance cameras are almost a necessity in our current times. Their intention is not only for employee monitoring and asset protection but also for precautionary measures. One reason for this is that they provide warehouse owners and warehouse managers protection from potential liability cases. In warehouse settings, machines are commonly in use and with that comes safety regulations. PTZ Cameras are a well-known option for surveillance monitoring in warehouse settings. What PTZ cameras offer compared to other camera types is the added ability to cover large areas with camera movement. This is primarily due to the fact that they can pan, tilt, and zoom in different directions and be positioned for automatically cover areas through preset tours. What this translates to is having one camera that monitors two separate areas as it moves, saving you from paying the cost of multiple cameras. Indoor surveillance cameras are generally cheaper and require fewer technologies than those intended for out applications. They don’t need to have the heavy weather resistance housing and their lens don’t need to be as durable. Outdoor surveillance cameras will need to have weatherproofing, durable mounts, thick lenses, and be properly installed. A common mistake made in self-installation for outdoor cameras is not properly securing domes, which will let moisture in, causing mold to form. Another common mistake people make is selecting the wrong camera lens type for their applications. Be sure to properly research field of view, distance, and range before buying an office security camera incapable of delivering the results you need. Day and night surveillance settings differ according to light conditions. 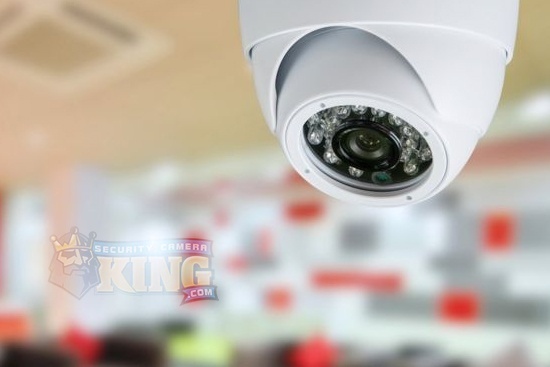 Light conditions play an important role in the ability of any office security camera to accurately monitor their settings and record usable footage. When installing any office security camera, make sure you locate areas that have optimal lighting conditions. Even if you have night vision cameras, most of these still need to have some level of light present in order to capture recordings that produce footage where you can actually see things clearly. Security Camera King prides itself on finding the perfect surveillance solutions for clients across a wide range of different industries. Whether you need an office security camera for small, large, warehouse, indoor, outdoor, commercial, industrial, or any other setting, our sales team can help. Be sure to investigate our entire collection of security cameras and surveillance products online to find see more specs and details for any products you’re interested in. All of our products have fantastic warranty options, come with free remote viewing software, and free technical support based right here in the USA.